Dildarnagar is a developing and new face town and municipal board in Ghazipur district in the Indian state of Uttar Pradesh. 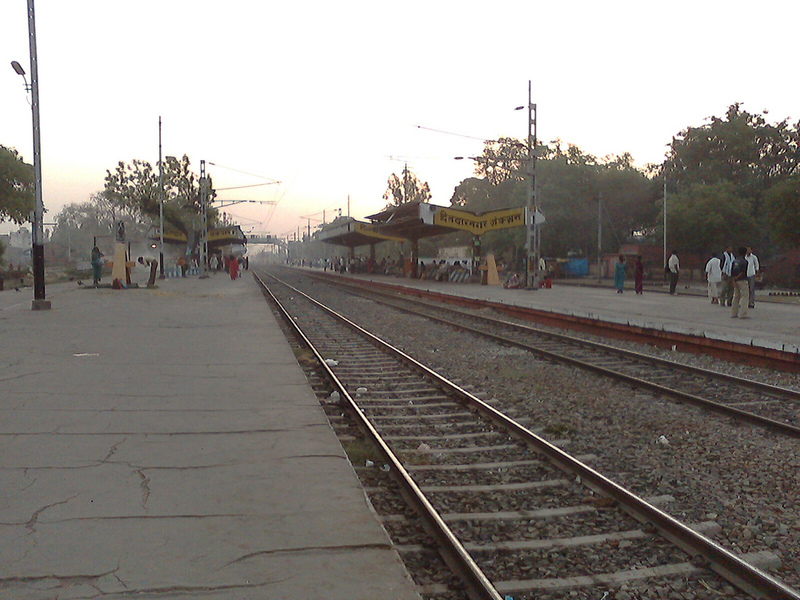 Located around 70 km from Varanasi, it is an important railway junction of the Indian Railways. Once, it enjoyed the position of the railway marshalling yard of Asia. The Grand Chord section, which starts from Asansol, West Bengal, terminates at Dildarnagar.Over the years the city has been subjected to severe electricity shortage owing allegedly to inefficiency and corruption prevalent in the electricity department of the city.it is regarded as a holy town by the more places like ghazipur,zamania,phooli,gahamar,bhadaura,mircha,rakasaha,usia,kurra,devaitha,etc.people who came from other place joy and great joy in dashehara festival,diwali,holi,id,bakarid,etc.Dildarnagar is most and great favourate place situated between varanasi and patna.it is one of the oldest continious inhibited town in the uttar pradesh and probably the oldest in ghazipur.Dildarnagar is most famous for its railway yard and its railway colonies. There are about 5 railway colonies. Dildarnagar Railway Division belongs to East Central Railway (ECR) Zone of the Indian Railway. About 125+ passenger trains pass from Dildarnagar Junction. The Divisional Rail Manager (DRM) office of Dildarnagar Division is situated here. At Dildarnagar Junction, Main Line (delhi-howara)) .Varanasi City is 70 KM from Dildarnagar Railway Station via GT Road.there is a one local train Dildarnagar toTarighat i.e.GHAZPURAHIYA. Dildarnagar is on National Highway No.97 which is known as Grand Trunk Road .Dildarnagar is located 160 km far from Patana by road. G T Road.the main road which is known as phooli road is linked from zamania-phooli-dildarnagar-gahamar-buxar. Rojgar samachar,dainik jagran is the only Hindi Daily News Paper of the city & ghazipur District. Dildarnagar has various schools and colleges affiliated to various Universities and Boards. In Dildarnagar, SKBM DEGREE COLLEGE, Adarsh Vidyalaya Inter College(affiliated to U.P., Allahabad) and Crescent Convent School,Nobel Senior Secondary School, New Shah Faiz Public School(affiliated to CBSE New Delhi), Nagar Palika and are the prime schooling institutions. While Graduate and Post Graduate Degree Colleges likeSKBM DEGREE COLLEGE, Women PG College are affiliated to Purvanchal University, Jaunpur (U.P),[Shahzada Industrial Training Institute]],*Nobel Senior Secondary School,G.G.I.C. Dildar Nagar,R.I.C. Dildar Nagar,Fatima Girls Inter College, Dildar Nagar. etc. Dildar nagar lies on the road from Varanasi to Buxar and 20 Km. from Ghazipur. Between the town and the station there is mound called Akhandha, said to have been the seat of Raja Nal and the large tank to the west is called Rani Sagar after his famous queen Damayanti. In the center of the mound are the ruins of two temples..A Hindu settlement owes its present name, perhaps, to Sadi." During the tenure of Aurangzeb a few market centres developed such as Dildarnagar (tahsil Zemania) named after one of his officials. Dildarnagar,2 village in tahsil Zamaniya, 20 miles south of Ghazipur, derives its name from a Pathan named Dildar Khan who settled here in the reign of Aurangzeb, after having destroyed the ancient Hindu town of Akhandha  The Mughals were victorious and the Rajput army was scattered. Dham Deo and his elder brother Kam Deo came down to Ghazipur with their families and followers. According to a book, Evolution and Spatial Organization of Clan Settlement by S H Ansari the Sikarwar Rajputs of Gahmar (one of biggest villages in Asia situated on the bank of river Ganga) emerged from Dham Deo andBhumihar and Kamsar Pathans emerged from Kam Deo. Many of the Khanzada Rajputs villages are situayed near the town of Dildarnagar. Major moses Crawfurd was at Dildarnagar with an army to intercept Chait Sing's forces advancing from Ramnagar.At the end of august Major James Crawfurd who was posted at chatra moved towards Dildarnagar in order to join the forces of Moses Crawfurd.He was also joind by Fateh Narain singh,the son of chhatrapati singh.